Guitarist David Torn has been exploring the terrain between rock, jazz and mutated world music ever since first hearing Jimi Hendrix. His sonic voyages start with a rock sound, but using innovative looping and audio processing, Torn quickly transcends the limitations of that form. 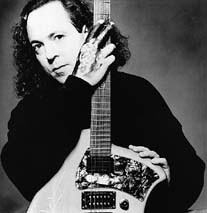 In 1994, he was lauded as "Best Experimental Guitarist" by Guitar Player Magazine Reader's Poll. Torn's music spans genres and blurs borders. His soundscape performances reflect his interest in textures, soundscapes and atmospheres. David Torn has five solo albums to his credit: Best Laid Plans (ECM), Cloud About Mercury (ECM), Door X (Winham Hill), Tripping Over God (CMP) and What Means Solid Traveller? (CMP). Over the years, Torn has recorded and collaborated with a broad range of music's finest talents. Among them are Jan Garbarek, Mark Isham, Bill Bruford, David Sylvian, Ryuchi Sakamoto, Patrick O'Hearn, Steve Roach, Mick Karn, Tony Levin, L. Shankar, Michael Shrieve, Andy Summers, Happy Rhodes, David Borden, and Eberhard Weber. Torn's expressive guitar melodies and lush textures have frequently been employed by Hollywood film composers such as Mark Isham, Patrick O'Hearn and Carter Burwell. His unique sound can be heard in the soundtracks to the films Romeo is Bleeding, Short Cuts, Kalifornia, Reversal of Fortune, The Public Eye, AirHeads, FatherHood, A Dangerous Woman, Storyville, The Beast, The Big Lebowski and many others. David's involvement with cutting-edge music technology has resulted in his working as a consultant or endorser with companies such-as Lexicon Corp., Klein Custom Guitars and Rivera Research & Development. He has also produced a CD-ROM of his soundscapes, and an instructional video aptly entitled 'Painting with Guitar'. 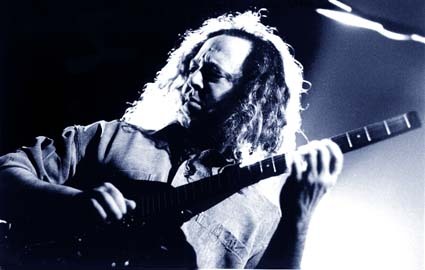 Among Torn's many live concert credits is his memorable performance at the Gathering in Philadelphia on 7 March 1998.